Rutland, VT —Betsy Ide Bloomer has joined the staff of Vermont Electric Power Company (VELCO) as Media and Strategic Communicator. 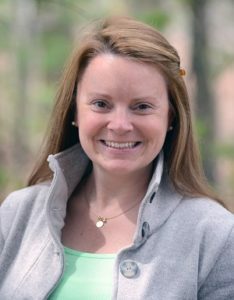 Betsy joins VELCO’s communications team, where she will support internal and external communications as the company delivers value to Vermont and helps create a more sustainable future. Betsy comes to VELCO from Green Mountain Power where she delivered innovative products and services to reduce the carbon footprint of Vermont and help customers save money through energy transformation. Prior to Green Mountain Power, Betsy was an integral part of Vermont’s Hurricane Irene Recovery Office and the Vermont Disaster Relief Fund, raising over $7 million for the unmet needs of families as they rebuilt homes and lives. Born and raised in the Northeast Kingdom, Betsy spent eleven years in Washington, DC, advocating for policies and projects on Capitol Hill that benefitted some of the country’s premier institutions of higher education and health care systems. She lives in Rutland with her husband Matt and young sons Will and Zach.